Timing truly is everything. I picked up this album while visiting Austin in the Fall last year. My friends took me to three record stores including Waterloo and I spent way to much money on records. Did I regret it? Nope. 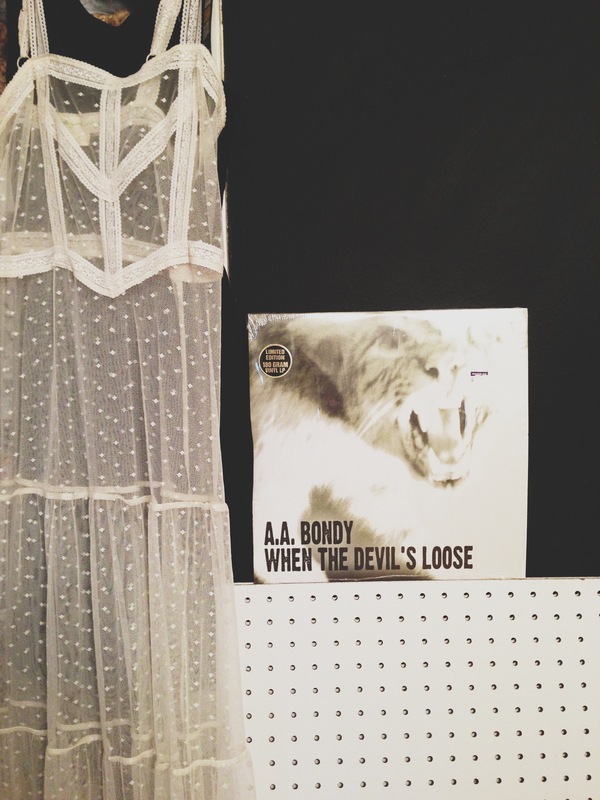 I can't tell you why I bought it in that moment, other than I really dig A.A. Bondy because I usually only buy what I can't live with out at that time. I wasn't really in the mood for this album back in october, so onto the shelf it went. Then while working last night, I was going crazy just trying to find the right thing to listen to (It's so irritating when you can't find the perfect tune to listen to... kinda like fumbling for the right word). I went the change the record and was almost done flipping through the entire collection when I remembered I had this. The needle touched vinyl and all was good in my head once again. It was the perfect night/vibe for When The Devil's Loose. Are you a fan of this album? Do you do that while shopping for music? Buy something for later? Or are you the person who buys only what your can't live with out in that exact moment? What about tunes? Bought any good ones lately?